I’m using the ten years of diaries I kept from 1985 as way of looking at what’s changed between then and now in terms of popular culture, technology, media and communication. I’m following the diaries chronologically on a day-to-day basis – so I’m always writing exactly 28 years later than the events I’m reading about. 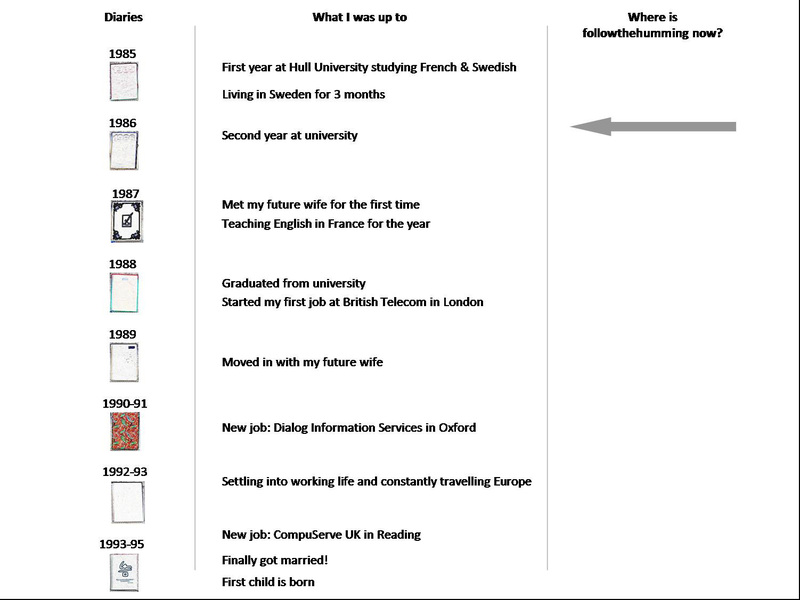 To put the whole thing into a bit of context, here’s a broader timeline of what was happening to me between 1985 and 1995. Since the diaries ended, work and family life have kept me so busy that I haven’t had much time to write about any of it until now. I currently live with my wife and three children in Yorkshire, in the north of England. As well as being Chief Hummer at followthehumming.com, I look after all things digital at StepChange Debt Charity, and moonlight as the Producer at Movie Parties. Just followthehumming. You know you want to.